Camfranglais fictional works are not canonical texts; rather they find a niche in the corpus of peripheral ethnographic texts that require an interpretive approach to literary discourse analysis and translational studies. In the light of the multilayered substratum from which Camfranglais literature derives its special qualities, it is incumbent on translators to have recourse to multidimensional frameworks in a bid to accomplish faithful translation—one such model, namely the Hermeneutic-Exegetic model is discussed in this book. We argue throughout this book that a serious exegetical study of the source text is the sine qua non of high quality translation (Magot, 1975); the moreso because the quintessence of translation is to produce a text that is faithful to the source text and in conformity with the structures of the target language. The purpose of translaton, after all, is to communicate to others what has been said or written in a foreign language (Vinay and Darbelnet, 1958). To paraphrase Margot again, the finality of translation is to transmit a message from a foreign language into the mother tongue of a particular group of readers who do not know the foreign langage in question. Thus, the translator must steer clear of subverting the exegetical process through skewed reading of the source text. The ramification of this injunction is that in addition to the exegetical endeavor, that is, the effort to understand the orginal text in its wider( literary, temporal, spatial, cultural, etc) context, the translator is expected to engage in a detailed unravelling of the universe of discourse in which the translation is intended to be utilized. This interpretative reading of the source text should take into account not just the linguistic elements of the source text but also the extra-linguistic factors that occasioned the conceptualization of the text in question. In the realm of translation studies, ‘exegesis’ stands for research into the background of an author, his woldview, influences exerted upon him by the milieu in which he or she lives and works as well his or her creative genius. Interestingly, it is desirable for the exegete-translator to stand back from the details of the source text in a bid to internalize its functioning and general structure. A successful application of the Hermeneutic-Exegetic model discussed in this book requires that the translator must wrestle against some of the presumptions that confine the practice of translation to the mere replacement of linguistic material in one text with equivalent linguistic material in another text(Catford, 1965). This approach presupposes that words in other languages are endowed with the capacity to bear foreign concepts, or that an equivalent concept exists in another language (Papastergiadis, 2000). Translation, if executed faitfully, is seen as either retaining or reflecting back the original meaning. From this perspective, translation can be perceived as interpreting and transforming the source text in a bid to create an equivalence in the target language. It is in this vein that Walter Benjamin(1968) argues that the task of the translator is one which consists in finding that intended effect upon the language into which he or she is translating which produces in it the echo of the original. To put this differently, to translate is to transport meaning from one linguistic code to another; it involves taking cognizance of the equivalence as well as the intransigence implied in the translation process. 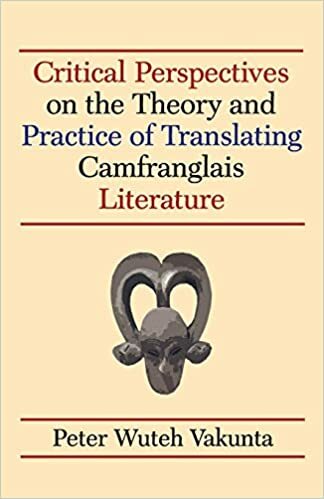 Using a corpus of four Cameroonian texts written in Camfranglais, this book offers ample discussion of major translation challenges posed by the cross-cultural and multilingual nature of Camfranglais.Vakunta's rigorous analysis attempts to provide answers to questions of translatability as well as language and cultural ambivalence. He effectively proposes a variety of translation strategies based on the theoretical approach that considers translation as an act of interpretation. This book is an essential reading for any translator interested in aspects of literary translation whether at a theoretical or a practical level--Professor Maribel Campoy, Department of Modern Languages, University of Indianapolis, United States of America.